Ticks like moist and humid environments and live in or near woods, shrubs, and long grass - places with shade and leaf litter to provide cover. Blacklegged ticks, also known as Deer Ticks, cannot jump or fly. Instead, they climb onto vegetation, such as shrubs and grasses, and when you brush against them they will climb onto your body and try to attach to your skin and feed. They are very small, which makes them hard to spot and their bites don’t hurt, which makes it difficult to know when you’ve been bitten. Adult blacklegged ticks are most active in the spring and fall. They remain active until the first snowfall or until the air temperature is consistently below 4°C. Larvae and nymphs are most active in the spring and summer. Lyme disease is a bacterial infection, acquired from the bite of an infected blacklegged tick, and can be serious if it is not treated. A tick carrying the bacteria that can cause Lyme disease can only transmit the disease after attaching and filling itself with blood, which takes at least 36 hours. Blacklegged ticks are found throughout Nova Scotia. 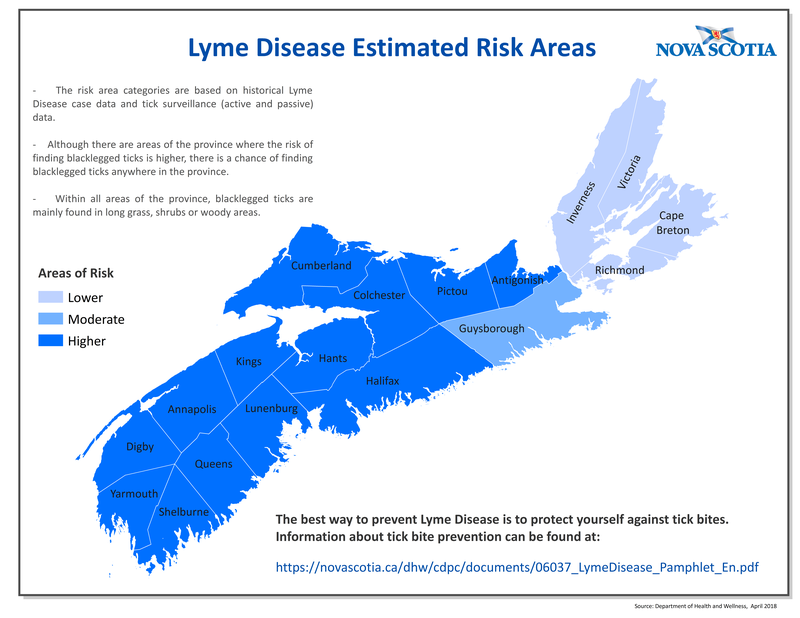 Individuals should refer to the Lyme Disease Estimated Risk Areas Map to check which areas are at higher risk. These symptoms may appear in stages, or over time. If you’ve been exploring outdoors, especially in wooded areas, forests, areas where tall grasses and or shrubs are present, or have found a tick on your body, and show these symptoms, see a healthcare provider. Each of these datasets has filtered views and charts created specific to Lyme Disease. Lyme Disease counts and rates are presented as one of two categories, Confirmed or Probable. More information on how these categories are determined can be found on the Department of Health and Wellness' Surveillance Guidelines for notifiable Diseases and Conditions for Lyme Disease. There are several ways to prevent or reduce contact with ticks, including wearing light colored clothing and enclosed shoes, ensuring skin is covered, and wearing insect repellent with DEET or Icaridin. It is also important to do a thorough tick check within two hours after outdoor activities. Ticks like warm places on the body. Refer to the Tick Check Basics Poster for more information. Carefully grasp the tick with tweezers, getting as close to the skin as you can. Gently and slowly pull the tick straight out - do not jerk, twist or squeeze it. Wash the site with soap and water and disinfect with rubbing alcohol or hydrogen peroxide to avoid other infections. Always contact your healthcare provider if you have found a tick and show the symptoms noted above. Learn more by watching videos produced by the federal government in English or French, and the video below, shared with permission from the British Columbia Centre for Disease Control, that helps families learn how to protect themselves from ticks and Lyme disease.